Is your work highly routine? If so, this post won’t provide much of value because you probably spend little time in meetings. But, if you are constantly dealing with new, messy, issues alongside your co-workers or clients, read on. This post is the first in a series I am planning on different workplace genres. I’m starting with meeting minutes because I’ve been discussing them with a student, and it occurred to me that most of the people I know attend lots of and complain a lot about meetings. The Microsoft Office Personal Productivity Challenge (with responses from more than 38,000 people worldwide) found people spent 5.6 hours each week in meetings; 69% felt meetings weren’t productive. And that was in 2005. I doubt those numbers have decreased in the past seven years. Business meetings also include two written components. That means agendas and minutes. Unfortunately, I haven’t seen research in this area in the journals I scan regularly. (If anyone has recommendations, I’d love to hear them.) Let me say a couple of words about agendas before I talk about minutes. I’m not going to say much about agendas — except that their creation is critical. Here’s a sample meeting agenda from a meeting I chaired a while back. Pros not only create an agenda, they share it with meeting participants in advance. 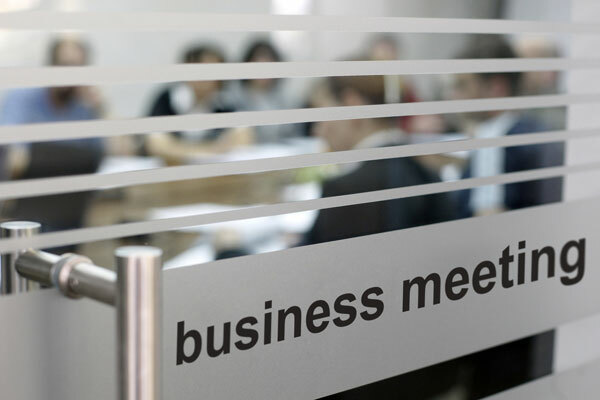 The agenda contains important items beyond the obvious like the meeting location: (a) what participants are supposed to do before the meeting, (b) where participants can find resources they need to prepare for the meeting, and (c) estimates of time allocated for each topic on the agenda. In others words, an agenda informs the audience about the meeting and directs them to prepare for it. The meeting participants are the primary audience for agendas. In addition to me, the participants at the meeting I chaired included another college administrator and four professors representing their academic departments on the MBA Committee (as well as my research assistant tasked with taking notes). 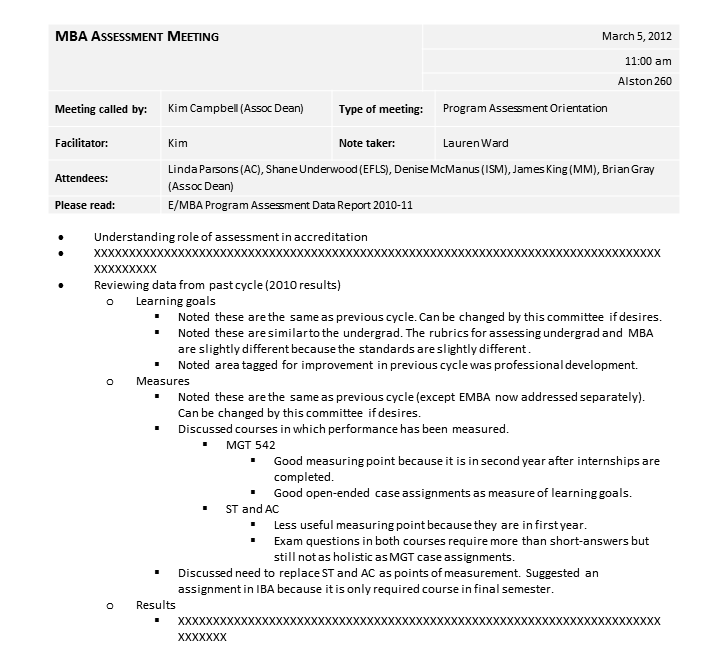 The group met several times to review data on student performance in our MBA program and, ultimately, to recommend ways to improve student learning in the degree program. Pros also use the agenda as a way to organize discussion in the meeting. One of the reasons I can get people to come to meetings I chair is that I am respectful of their time. They know I will do everything I can to make the meeting productive. And the agenda is a signal that I have prepared for the meeting in advance. OK. Let me (finally) get to the core of this post: meeting minutes. Taking notes during a meeting is much easier if there’s an agenda and discussion follows it. But even when this is the case, the unedited notes are not meaningful to anyone other than the note-taker. And only briefly for him or her. The audience for minutes is broader than for agendas. 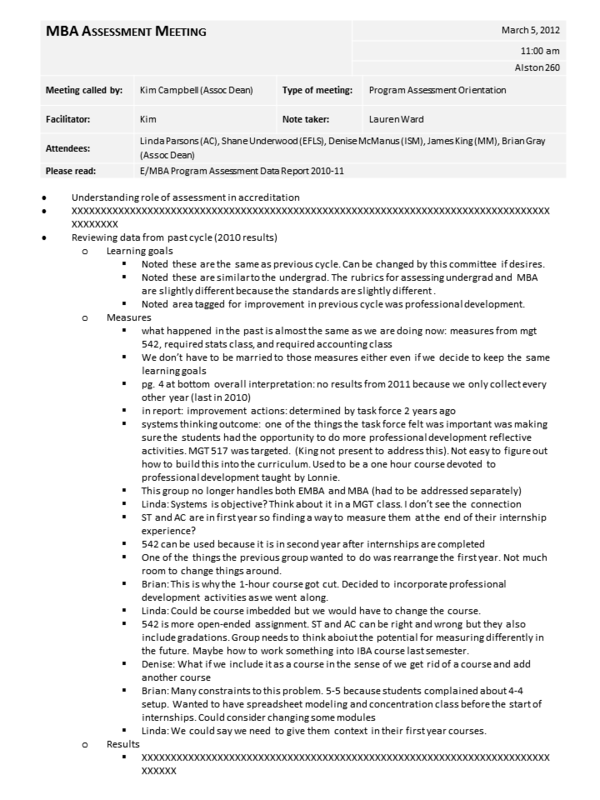 The meeting minutes for which I provided the agenda above might be read by the participants (especially anyone who had to be absent or leave early from the meeting) but also by other college and university administrators and accreditors. The first page of notes taken during the meeting are shown below. The image quality makes it difficult to read. But note the long laundry list of bullet items under the heading “Measures” in the middle of the page. These notes represent a chronological recording of the discussion. That’s all my research assistant could create during the meeting. An amateur would simply call them the meeting minutes, send them out, and call it quits. But a pro knows better. After the meeting, a pro edits the notes into a document that captures the content of the discussion in way that can be understood by someone who wasn’t there. In fact, the unedited notes are not likely to be understood even by the meeting participants themselves a week or more after the meeting. The relevant portion of the meeting minutes created from the unedited notes is shown below. The minutes are organized by topic not chronology. Only three major bullet points appear under “Measures” now. Several of the bullets from the notes were combined, and several were moved out of this heading because they represented discussion that happened while we discussed measures but which were about topics covered elsewhere in the meeting (e.g., results). The style of the minutes focuses on meeting actions. Each major bullet point under “Measures” now begins with a past tense verb. “Noted” is used to describe topics mentioned, usually by the meeting chair, but not discussed. “Discussed,” on the other hand, denotes topics about which there was conversation. Elsewhere in the minutes, there are items beginning with “Decided” to denote decisions made by the participants during the meeting. The style of the minutes focuses on topics not people. There are no participant names in the bullet items under “Measures” because their identities are not important to the purpose of the meeting or the audience of the minutes. For this reason, others have mentioned that passive voice is useful in meeting minutes. Because participants in business meetings represent their work unit (or organization) and those units’ views are sometimes important both to capture and attribute, I might write something like: “Discussed IBA faculty’s concerns about locating individual measures of performance.” But the emphasis is still on the topic — not the people. I shared the minutes — not the notes — with the participants at our meeting to invite their corrections or approval (as protocol demands). Note: the portion of the minutes I’ve shown you doesn’t include the all-important “Action Items” arising from the meeting. That was probably the section of most interest to participants in this case. For governing board meetings, minutes have legal implications. See the Nonprofit Law Blog article below for some useful resources. Although there are some special considerations, the article corroborates what I’ve said in this post. Before I hit the publish button, let me note that there are some cool tools for taking notes and sharing minutes quickly. But, no matter how quickly the minutes can be recorded, such tools are worthless if the minutes themselves are not written by a pro. This post is beneficial to all manner of higher education. If you haven’t written an article about this, you should. Thanks for this fine post. Thanks, Tim. I agree this is a genre that deserves some attention.